Part TWO of a series chronicling interviews with activist Drew Powell and Silver Spring marketing director Susan Hoffmann, who are both running for mayor of Rockville. Susan Hoffmann, Rockville mayoral candidate, admires her handiwork in the new Town Square. Check out our interview with Drew Powell, also running for mayor. Without knowing it, you've probably tasted the fruits of Susan Hoffmann's work. Or heard. Or ridden. She's a Rockville City Councilwoman by title, but her influence can be felt nowhere more than in Downtown Silver Spring, where for the past several years she's become a big-haired booster of all things Silver SprUng. Her list of accomplishments as marketing director for the Silver Spring Regional Services Center are staggering: planning a yearly Thanksgiving Parade through Downtown Silver Spring; an annual Jazz Festival, whose headliner two years ago was Wynton Marsalis; the weekly Silver Spring Swings concert series; a nascent Restaurant Week; and a firsthand role in the redevelopment of Silver Spring's town center. But please, Hoffmann insists, don't call her the "Mayor of Silver Spring" (as everyone from the Silver Spring Voice to the big D.C. blog DCist already do) because in a few months, she might be Mayor of Rockville. "First and foremost, I will be mayor of Rockville [if elected]," Hoffmann says. "It may not pay the most, but it will be my primary job." 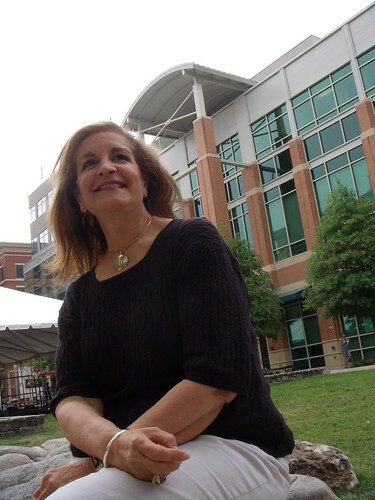 Planning for the yearly Silver Spring Jazz Festival, shown here in 2006, is spearheaded by Susan Hoffmann. "[Doug Duncan] left an imprint that will be lasting for generations." She looks to Doug Duncan, her former boss, for inspiration. "Doug did it all," she says, referring to his work in Downtown Silver Spring ten years ago. "He had a vision, he saw it, and he did whatever it took to get it done . . . he left an imprint that will be lasting for generations. 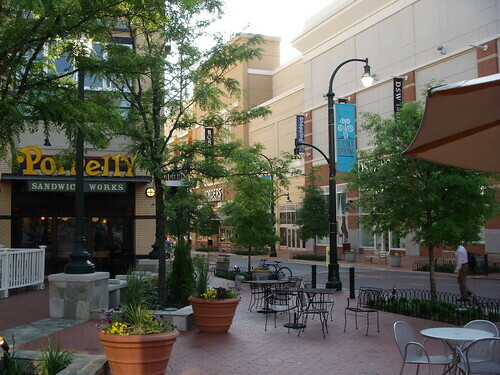 It makes me jealous, if I could do something like that for the City [of Rockville]." And, it seems, she already has. 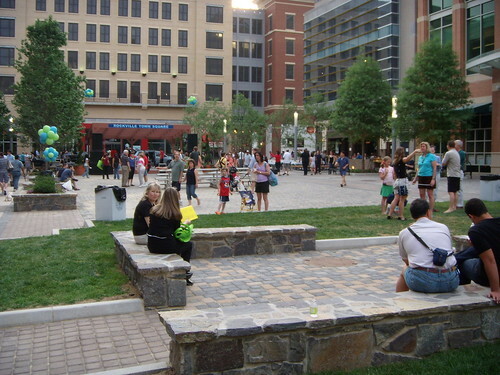 The result of years of heated City Council meetings, Rockville's new Town Square has given the Mid-County a new gathering place with the potential to spark an urban renaissance not unlike what is currently happening in Downtown Silver Spring. "It's hard to explain what it feels like to see something you had a hand in," Hoffmann says as we walk through the new square. "I walk around smiling. People think I'm a lunatic." Even the buses excite Hoffmann. As we sat down for coffee in a recently-opened Starbucks, several Ride-On Route 45 buses flew past the window. It was Hoffmann's proposal to have a shuttle than ran between the City's several neighborhoods and the new town center. "It's nice when dreams come true," she sighs wistfully, admiring a 45 as it goes by. "Not only did we do it, but we did it right . . . and it looks great." A walk through the Town Square shows how the City of Rockville learned from Silver Spring's earlier mistakes in planning the development. Five stories of condominiums rise over the shops and restaurants, creating a permanent consumer base for the retail and a constant human presence in the square. The streets are narrow, the building façades animated, and the parking garages are tucked neatly underground. "I'm all about trying to provide community-building activity . . . and you don't take a nap in the winter." One mistake that will soon be fixed, Hoffmann argues, will be "the Turf," the popular but controversial fake-grass hangout that will be torn up at the end of the summer to make way for a paved town square. "I don't know what the hell they were thinking," Hoffmann spits, referring to its original installation nearly two years ago. "'The Turf' is filthy, it's disgusting . . . it's a petri dish. People let their dogs pee on it." 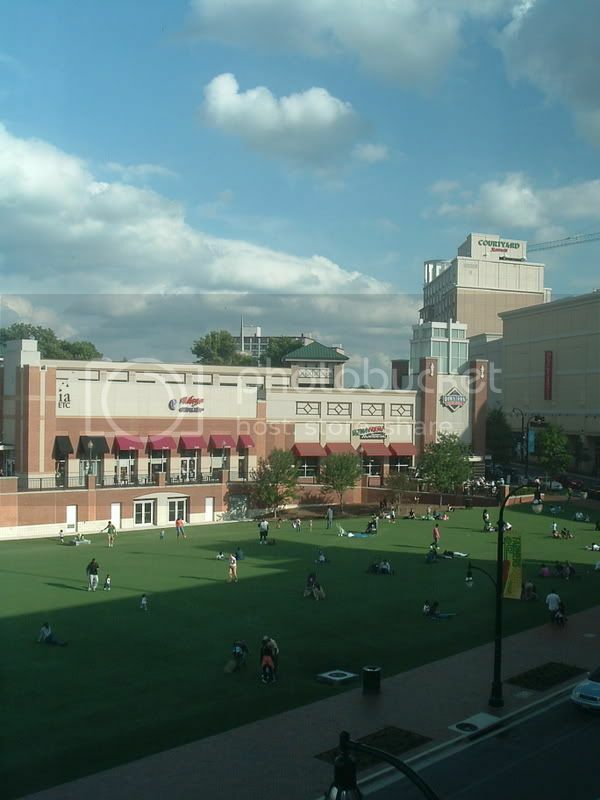 The future Civic Center and Veterans' Plaza, as the town square will be called, will make Downtown Silver Spring busy all year round, Hoffmann insists, especially because of the ice rink. "I'm all about trying to provide community-building activities," she says, "and you don't take a nap [on the ground] in the winter." (Just Up The Pike is curious how many people nap on "the Turf" as it is, and if they would be just as willing to nap on a hard plaza.) "It was so perfectly clear that having a winter activity [the ice rink] created a captivated plaza." Off the ice, Hoffmann has plans to keep the plaza captivated as well. Unlike "the Turf," the Civic Center gives her more opportunities to bring new events (and support existing events) Downtown. While the New Year's Eve celebration First Night - a popular Silver Spring event throughout the 1990's - will remain at the County Fairgrounds in Gaithersburg, Hoffmann envisions a similar party on Veterans' Plaza. "What I intend to do in Silver Spring when the civic building is built is to have some kind of event," she says. "It won't be a large, county-funded [event] . . . it'll be the businesses." Making the county do the legwork, Hoffmann laments, can be time-consuming. Her experience with both the City of Rockville and Montgomery County have made her a strong fan of living in a municipality. "You see the effects of your work pretty soon," Hoffmann says of her projects as city councilwoman. "I think it does take longer [in the County] in terms of impacting legislation. It just takes longer to happen . . . it takes longer to be implemented." 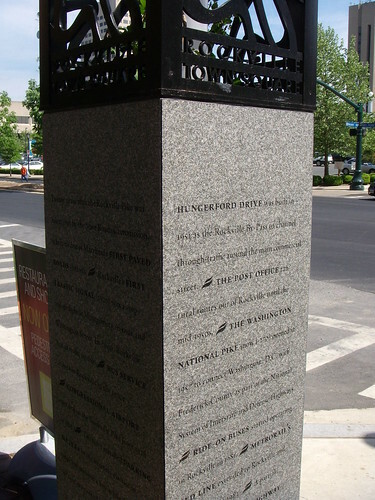 "I noticed when I came here a spirit, a love for the City [of Rockville], and I came to love the City very early on." But, best of all, Hoffmann says, living in a proper city engenders a sense of community that the unincorporated parts of the County just don't have. Bethesda "does not have a particular character the way Rockville is," she argues, and Silver Spring "is a lot of things, depending on where you are." "Rockville . . . is a city of neighborhoods," Hoffmann says. "And they're all different, but at the end, they all come together and support being a part of Rockville." This fall, she hopes that they will all come together and support her for mayor. Having lived in the city for twenty years - and, of course, being a familiar face to many Montgomery County residents - offers Hoffmann a visibility that her opponent, former head of Neighbors for a Better Montgomery Drew Powell cannot compete with. Even Hoffmann doesn't know anything about him. "I know very little about my opponent and what his issues are," she says. "He's only lived here for two years . . . that's really all I know." Hoffmann pauses. "I know they [the Neighbors] oppose all development." NEXT WEEK: Is that really what Drew Powell's about? Find out: we're finishing this thing for good. Hoffmann seems to be a level-headed, smart and accomplished woman, with a real record. I'd love to know what Drew's record is, and what he claims as accomplishments. All I really know about him is that he is new to Rockville, tried to capitalize on the SS photo controversy, and just shaved his beard off. What qualifies him to be mayor? Jason (AKA Susan Hoffman), the only reason Hoffmann has a “level-head” is her overuse of Botox. Her only real record is voting against public hearings, giving away $11M taxpayer dollars to her VisArts supporters and taking half of her 2005 campaign donations from developers. Mr. Powell’s record is built on telling the truth about overdevelopment in Montgomery County (and Rockville) and helping to get progressives like Ike Leggett and Marc Elrich elected. To a large extent, Drew can be credited with the new citizen-friendly county government we now enjoy. 'She looks to Doug Duncan, her former boss, for inspiration. "Doug did it all," she says...' Give me a break. He didn't build the needed roads and transit to go along with his hyper development schemes promoted by HIS constituents (and extreme contributors)... developers. He sold county land for pennies on the dollar to his campaign contributors (Belt and Montgomery Hills Junior High Schools) and took tainted Jack Abramoff money in return for favors, for which the FBI knocked on Doug's door (case not closed yet). Quite a roll model Susan. One thing I admire about Susan, and her "alleged" camp (Jason W.) is their ability to not degrade the challenger and instead favor a positive issues-based race. Ms. Hoffmann seems to have had an important role in keeping Rockville progressing with its surrounding neighbors like Gaithersburg and Silver Spring. 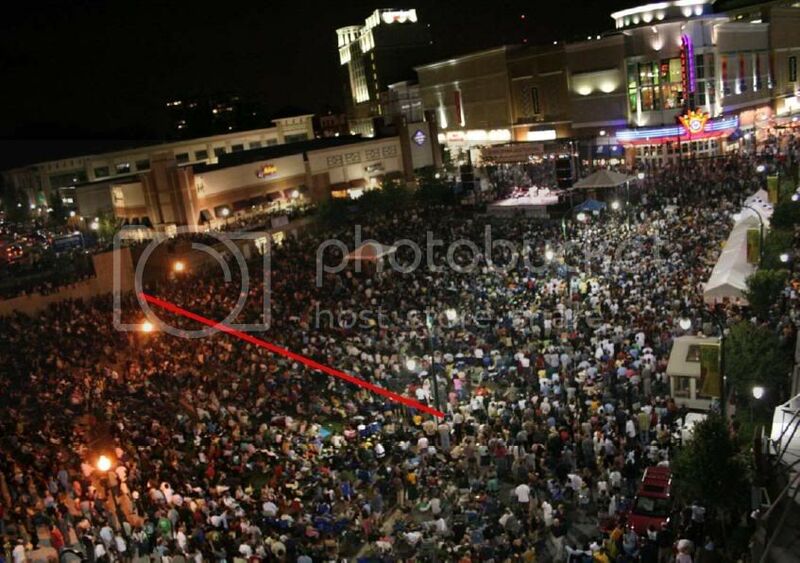 I don't see anything wrong with wanting to have our community congregate in Town Center. Getting to know one another never hurt anyone. Maryland LOVES Powell, as evidenced by his excellent relationships with state and county officials, who include Governor Martin O'Malley, County Executive Ike Leggett, and County Councilmember Marc Elrich.